Eclectic (at Best): Coach Glaze Writes a Book! I will always think of Tom Glaze as "Coach Glaze" and assume the highlight of his life was coaching summer baseball in Fayetteville. He came from Missouri to the University of Arkansas to play baseball (a picture of him as a catcher on the team is in the 1960 yearbook), and while a student, volunteered his time to coach little league. He got his undergraduate degree in 1960 and law degree in 1964, then accomplished a few things such as successfully battling for election law reform and getting elected to the Arkansas Supreme Court (1987 - 2008). I have always assumed that much of his success came from what he learned teaching towheaded kids like me how to field a grounder. I look forward to reading his new book from the University of Arkansas Press. He picked an excellent co-author, Ernie Dumas, who knows more about the history of Arkansas politics during the past 50 years than anyone around. The book is illustrated with political cartoons by the Great George Fisher. 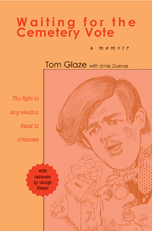 Coach Glaze was on the front line of investigating election fraud beginning in 1965, when he was headed the "Election Research Council," created by Winthrop Rockefeller. His trips to Conway (home of Marlin Hawkins), Perry, Phillips, Crittenden, and Searcy Counties were not always pleasant: the entrenched regimes did not welcome scrutiny of their election practices. Tom was instrumental in the late '60s, as an assistant Attorney General, in writing a revision of the state's election law, which was adopted by the state legislature. He continued his work with election reform as head of the Election Law Institute from 1970 - 78. After serving as a Arkansas Court of Appeals judge from 1981 to 1986, he was elected to the Arkansas Supreme Court in 1986. He retired in 2008.